Prof. Maggie Hu is currently an Assistant Professor of Real Estate and Finance at The Chinese University of Hong Kong. 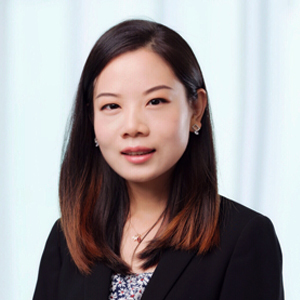 She received her PhD in Finance in 2013, and Bachelor of Engineering from National University of Singapore in 2008. Her main research interests include empirical corporate finance, banking and real estate finance. Her research papers have been presented at several international finance and real estate conferences, and published in leading journals such as Journal of Financial and Quantitative Analysis and Real Estate Economics. Maggie Rong Hu and He Wen (2014), “Aggregate Earnings and Market Returns: International Evidence,” Journal of Financial and Quantitative Analysis, 49(4), 879-901. Xudong An, Yongheng Deng, Maggie Rong Hu, and Jeffrey D. Fisher (2016), “Commercial Real Estate Rental Index: A Dynamic Panel Data Model Estimation,” Real Estate Economics, 44(2), 378-410. Maggie Rong Hu and He Wen (2016), “Religion and Bank Loan Terms,” Journal of Banking and Finance, 64, 205-215. Yongheng Deng, Maggie Rong Hu, and Anand Srinivasan (2017), “Information Asymmetry and Organisational Structure: Evidence from REITs,” Journal of Real Estate Finance and Economics, 55(1), 32-64. Yuanli Fang, Maggie Rong Hu, and Qingsen Yang (2018), “Do executives benefit from shareholder disputes? Evidence from multiple large shareholders in Chinese listed firms,” Journal of Corporate Finance, 51, 275-315. Maggie Rong Hu, Xiaoyang Li, and Yang Shi, “Adverse Selection and Credit Certificates: Evidence from a P2P Platform”. Yi Fan, Maggie Rong Hu, and Xinwei Wan, “A Tale of Two Cities: The Impact of Cross-Border Migration on Hong Kong’s Housing Market”. Maggie Rong Hu and Adrian Lee, “Melting Pot or Salad Bowl: Culture Distance and Housing Investments“. Wen He, Maggie Rong Hu, and Jin Yu, “How Stable are Corporate Capital Structures? International Evidence”. Maggie Rong Hu and Adrian Lee, “Street Name Fluency and Housing Prices”. Maggie Rong Hu, “Industrial Competition and Bank Lines of Credit“. Yongheng Deng, Maggie Rong Hu, and Anand Srinivasan, “Hold-up versus Benefits in Relationship Banking: A Natural Experiment Using REIT Organisational Form”. Maggie Rong Hu and Agarwal Sumit, “Liquidity Dynamics between Property Market and REIT Markets“.